When I received my CR-48 (read: Chrome notebook), I instantly noticed a need for a shared clipboard between my computer and the CR-48. I downloaded Google's Web Clipboard, however, it took a while for the pastes to appear on both machines and I had to sit and wait for it them to load. So I made my own extension that simplifies the process and allows you to share any type of text right from the context menu. Cloudboard was born. Install the extension, login via Google to the Cloudboard site and get your token, then start sharing. You can right-click on images, urls, pages and text to share with your other computers and all you have to do is click on the clipboard next to the address bar to see a list of your pastes. If you want to refresh, hit the refresh button, or just open the popup again, it is updated instantaneously with your other Chrome installations. Feel free to leave any comments that you have. I will be working on notifications, so you can be automatically notified when a new paste exists. Using Cloudflare to protect your website is a great choice, however, it can break your existing applications because the IP that your server sees is not the user's, it is Cloudflare's. Cloudflare has a module for Apache to rewrite the IP with the correct one (here), but not for lighttpd. The following 3 steps will get your IP rewritten and have your access logs printing out the correct IP for the connecting user. 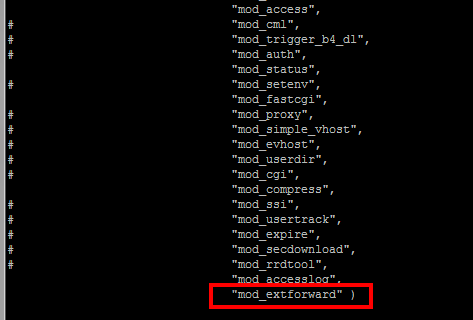 Step 1: Open your lighttpd.conf file and append "mod_extforward" to the end of the server.modules list. Step 3: Restart lighttpd and you're good to go! You should now see the actual user IPs in the access logs and in your applications. Don't know what you would use them for. But, enjoy!